The 1899 Height of Buildings Act established that no building could be taller than the Capitol (289 feet), but if that’s the case, why don’t we have a city full of 28-story buildings? Well, in 1910 the act was amended to restrict building heights even further: no building could be more than twenty feet taller than the width of the street that it faces. So, a building on a street with an 80-foot right-of-way could only be 100 feet, or 10 stories. This preserved the “light and airy” character of Washington that Thomas Jefferson envisioned. This 1910 law is still in effect today, and it essentially means that no building can be taller than about 13 stories (with the exception of Pennsylvania Avenue, which is zoned in some places to allow buildings of up to 160 feet). Today we DC residents are lucky that we live in a human-scale city without the wind tunnels and shadowed streets that other cities have. There are no huge expanses of surface parking lots downtown (with one notable exception), because the value of land is so high. Rooftop decks provide beautiful vistas of the city, and yes, you can see the Washington Monument and the Capitol dome from many places. 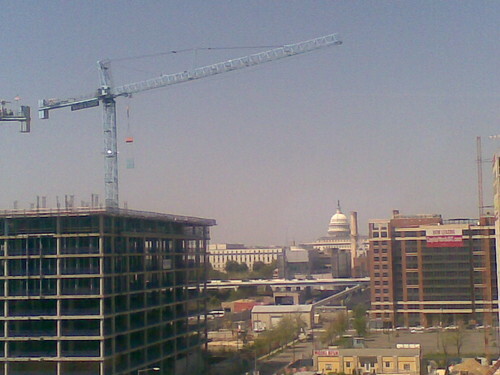 However, it’s also true that the height limit is artificially raising rents downtown (DC’s downtown real estate value is second only to Manhattan), constraining development and therefore limiting tax revenue to DC, and that many companies are being pushed out to Arlington or Bethesda, where skyscrapers are allowed. And the restrictions on building heights near Metro stations seems counter-intuitive to the tenets of transit-oriented development. But I’ll leave the debate over the height limit to the Washington Post and the real estate guys and the worriers and the urban planners. So now you know– the height limit has nothing to do with being able to see the Capitol dome from anywhere in the city. In fact, there are three buildings (not counting the Washington Monument) in the city today that are taller than the Capitol. First commenter to correctly guess all three gets my congratulations and respect– I could only think of one! Update: I love how many commenters are sharing their opinions on this! It’s really an issue that people feel strongly about, and there are really compelling arguments on both sides. I wanted to address the issue of how sure I was that the original height act was there for fire and safety reasons, and to answer: I’m pretty sure. I first learned about it in September of last year at a lecture at the National Building Museum on the Height Limit, which you can listen to online. There are also a number of online sources that back me up: the planning website Planetizen describes the fire-fighting issue, while DesignCult describes the technology and safety issues. Surveyor Wendy Lathrop describes both the fire hazards and the building material and structural concerns that inspired height limits at the time. If you’re interested in the history of height limits in general, I’d recommend reading Chapter 3 (“The Sacred Skyline”) of Robert Fogelson’s book Downtown: Its Rise and Fall. As it turns out, many cities had height limits at the turn of the century, but the District’s was never repealed and it became a distinctive feature of the urban landscape. Why was it never repealed? Possibly because people really liked the “light and airy” character that Thomas Jefferson envisioned, possibly because after the advent of rooftop decks, District residents loved their views, or possibly because it would require an act of Congress to change it. Either way, it has become ingrained in DC’s culture, and it looks like it’s here to stay. Pierre L’Enfant hated John Jay. Nice work Kevin! You win. Sorry the prize isn’t something better than my congratulations. And Miranda– so close! The LDS Temple is out in Kensington, MD, but if it were in DC it would be on the list too– it’s the same height as the Capitol Building. Having gone to Architecture school in the city, both of those myths were propagated to us from the school itself. The lack of a J street is supposedly the interchangeability and lack of clarity between an I and J in those days, but I could be wrong on that. In response to Chas, AHHHHHHHHHHHHHHHHHHHHHHH! And John, you’re totally right. The letters I and J apparently looked the same back in those days. I guess I’m still a newbie to the city after all, 2 1/2 years after moving here- I’d never once heard the John Jay thing before. Not to upset Shannon any further, but… whats that about? As for the real reason its a short city… very interesting. Glad its in place too- its kind of nice to be able to look across the whole city the way we can from up high, like in my office in Rosslyn. Not many places we can say that about in the U.S. for large cities (Denver being an exception, if you ever go out there head up Lookout Mountain for a view you’ll never forget). There’s a myth going around the city that there’s no J Street in between I Street and K Street because Pierre L’Enfant hated John Jay. Check out the Snopes article (http://www.snopes.com/history/american/jstreet.asp) or the WaPo article (http://www.washingtonpost.com/wp-dyn/articles/A9336-2003Oct23.html) for more. I’m totally with you on appreciating the ability to see the whole city from up high. And I just came back from Denver last week and just loved it! I hiked up to Red Rocks and got a nice panoramic view of the city from there. The John Jay thing was something to the effect that L’Enfant hated Jay over some love spat or affair and in order to get back at him, he struck his name from the city grid. The Washington Post put this forth in 1979. THe bottom describes teh J vs I issue. Doh! beaten to the punch. Sorry to beat you to it John! My favorite part of the whole affair/love spat legend is that apparently John Jay stole L’Enfant’s wife or something like that, and that’s why L’Enfant was so angry. Too bad L’Enfant was gay… otherwise, it really does spice up the story a bit. Whatcha talking about? I live on J street. And oddly, there is Jay Street. So really, from a traditional and classical sense, having an I and J street would be over kill. @dcdc I suspect you are in the majority, but perhaps a poll would tell. It is a bit embarrassing to know the truth behind the height restriction. I like the myth better. An unfortunate side effect is that DC has a lot of new development that looks like square boxes with every building looking the same. But on the positive side, it maintains some of the similarities to European cities because of the height restriction and layout. I actually prefer the height restriction; if it was struck, we’d soon have towering concrete pillars that would pretty well destroy our beautiful sight lines and create horrendous urban canyons. I lived in Chicago for several years and I hated walking around downtown; it felt depressing and oppressive. I much prefer DC’s city structure and hope this remains for decades to come. We’re unique as a ‘big city’ in our look and I think we need to retain that. Thank you so much for busting this myth! As an interning ‘Architect’ who grew up around here, I’ve always liked the scale of DC. Metropolitan without being overwhelming. One of my father’s co-worker, who had a killer view from Rosslyn, once described it as ‘mediterranean’ and I think he’s right. So wait … is the Cairo the tallest residential building in the District? The Cairo is 12 stories tall. My partner owns a condo on the 11th. The Cairo is 164 feet tall, and I think the Post Mass Ave is just a few feet shorter. It’s hard to tell though, because of topography. Either way, the Cairo still holds the title as the tallest residential building in the city. Love the article… I’ve perpetuated the myth myself… but one of the reasons I note to people WHY I love DC is because of the height restrictions making the city palpable and open. I despise New York City because of the canyons and the oppressiveness of buildings. Post Mass Ave bills itself as the tallest in the city, it has fourteen floors plus the roofdeck. Opening up on the height would increase density, which would increase retail and make this a more vibrant city. I LIKE tall skyscrapers. Plus, the city doesn’t have any great sightlines other than Penn. Ave. My idea has always been to open up everything north of I st., and south of Independence. Keep the main federal corridor low. Oh, and the whole “wind swept canyon” think is an anachronism. The only place that really exists in Wall St., in NYC. That is because the roads are narrow and crooked. It would not be a problem in DC. I just don’t see a down side to being more like downtown B’more. Skyscrapers do not increase retail density. Rarely is retail successful off the first floor. Skyscrapers increase commercial and residential density, which can provide more users for first floor retail space. DC’s problem is a suburban nightmare. Vertical density won’t fix that. Northern VA has none of the height restrictions across the river, and very few structures there top 12 – 14 stories. Granted, there are FAR (floor-area ratio) transfers that occur, but the only places with dense development are immediately adjacent to rail metro stations. Taller buildings require a more secure envelope and end up creating more electrical draw to heat and/or cool their hermetically sealed curtain wall structures. There is also the issue of human scale. tall skyscrapers (and most tall buildings these days) seem to loose all sense of scale and interaction with the pedestrian. This is the thing that makes old main streets and neighborhoods in NYC feel so vibrant and why modern attempts to recreate them seem to be a “disney-fied” version of a great idea and feel more like a film set or a backlot than reality. Taller buildings is not the solution. Look at downtown Philadelphia. That’s depressing. Can you provide documentation that backs this statement up? I can’t find the text of the original Act online and from previous reports, it’s unclear what the intent of the Act really was. Your whole myth-busting argument is based on this claim, so I think it deserves some citation. Not saying you’re wrong, but it’s just as likely that the Act was pushed through to preserve a low city landscape when people were upset by the monstrosity that was the Cairo. And even if it was enacted for safety reasons, those are invalid now, so why hasn’t it been repealed? Even if the original intent was for safety, the current law is based on aesthetic value to the city. Maybe the semantics of the myth are incorrect, but the spirit of it isn’t. So, yeah, I’m saying you’re wrong. Skyscrapers increase population density. That increases retail density on the first floor. Look at the barren stretch along Mass ave. I agree with you about the cool neighborhoods in NYC. I used to live on the UWS and loved the brownstones. However, you sort of prove my point. There is no reason both can be zoned for. All I see with the height restrictions are ugly box architecture and a city that has put a governor on growth. @EchoWhiskey, I wanted to include a variety of sources and links, so I updated the post with some documentation. Hope that helps! Skyscrapers do NOT necessarily increase residential density, because skyscraper districts tend not to use every nook and cranny of land the way walk-up districts do, and because skyscraper apartments can’t be divided into smaller units as easily. Columbia Heights, for example, is much denser than Ballston. For trivia purposes, can anyone name the other two buildings in DC that are taller than 200 feet, besides the four mentioned above? I like the height restriction just fine; bigger buildings would not necessarily be any prettier than the typical K Street box. And here’s to hoping this post beats out “Geriatric Superstar” for number of comments! I know that the building on the north side of Franklin Square is taller than 200 feet, but I’m not sure how much taller. From your keyboard to God’s ears, Art. There are many sightlines in D.C. if you bother to look up when you are walking. Most of the places where tall buildings are being proposed, like 10 twelve story buildings on the southwest waterfront, would severly compromise not only sightlines but access to the waterfront. People in DC need to get over this need to build to the max and just build to the place they are building. 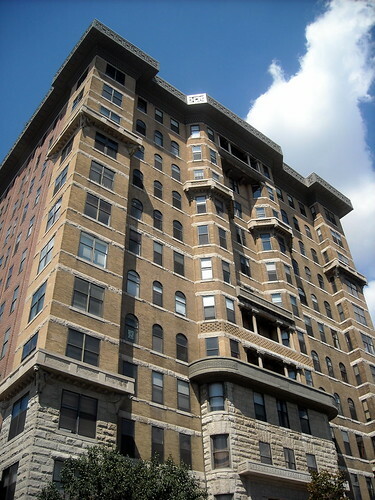 Did Columbia Heights really need buildings that tall within feet of the street? @Tom Bridge – You’re right. One Franklin Square (210 feet) is one. The other is the 200-foot-tall Healy Building at Georgetown Univ. Wow…I’ve lived in DC almost 30 years, and I always – ALWAYS – heard that the height restriction was based on the Washington Monument, not the Capitol. Then again, I’ve never been to half the Smithsonian museums, either. check out this video, 5 minute history of the Cairo. Very good. So proud I actually knew this one! A friend did one of those dc bus tours- apparently you do actually learn useful things! ps. on the comment of J street- does anyone know why we don’t have a ‘b’ street? Thanks! A look at a street map shows that Constitution and Independence Avenues run where B Street would be. I believe this is why these are the only avenues running east and west, instead of at angles to the grid of numbered and lettered streets. East of 2nd Street NE and SE, you can find A St NE and SE. West of the Capitol, these are mirrored by Madison Drive NW (= A St. NW) and Jefferson Drive SW (= A St. SW). Oops…if you go far enough east, like past the Anacostia Freeway, you DO find B St. SE. It stops and starts; there’s a section just south of the Benning Road Metro stop. Don’t forget the main building at Georgetown (Healy Hall). This may just be another myth, but I believe the Capital is taller from ground to top, while Healy is higher (because it is located on the Georgetown hill).